Money inside a 529 Plan is a godsend for parents footing their children's college tuition bills, except when it isn't. What happens if a child (the plan beneficiary) decides not to attend a four-year college after high school? When money in 529 College Savings Plan funds is spent on non-qualified expenses (that is, not on college tuition and related expenses for the beneficiary), account owners pay ordinary income taxes and a 10% additional tax penalty on earnings. Send myself to college or graduate school. If my child decides not to attend college, I can spend the money on my own education. I'd name myself as the beneficiary. Then, I could pursue a graduate degree using 529 funds. Pay for tuition and expenses at a technical or vocational school. A student doesn't have to attend a traditional university to spend down 529 Plan funds. Expenses at technical and vocational schools as well as community colleges may be eligible for tax-free withdrawal from a 529 Plan.SavingforCollege.com has a lookup tool to determine a school's 529 eligibility. So, if I felt generous, I could fund the education of an in-law, nephew, or first cousin by changing the 529 Plan beneficiary. Just because a child doesn't go straight from high school to college doesn't mean that he'll never attend an institution of higher learning. He might want to work, travel to Europe or South America, hike the Appalachian Trail or Pacific Crest Trail, or pursue a career as an entrepreneur immediately after high school graduation. After a few years or even longer, he may decide to earn a bachelor's degree in order to build upon his real-life experience. Instead of telling him it's too late, I'll have cash on the ready to fund his college dreams. Claim the money without 10% penalty under certain circumstances.Let's say my child decided to enter the military after high school and now plans to attend college using veterans' benefits. He no longer needs all of the cash set aside in a 529 Plan. I may be able to take a plan distribution up to the amount of educational assistance he receives without incurring the 10% penalty on earnings. Similarly, those who receive employer-provided educational assistance may avoid tax penalties. Check with the IRS to learn about exceptions to the 10% additional tax. Leave a legacy. Let the money inside the 529 Plan sit there. When my children have children (possibly), I could name my grandchildren as beneficiaries. In this way, my children can focus on saving for retirement while my grandkids can avoid student loan debt. 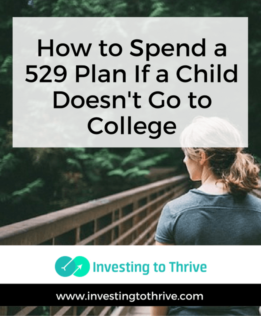 Withdraw the money and pay the taxes.If my child decides not to attend (or finish) college and I want to withdraw the money held in a 529 Plan, I can certainly access your funds. Typically, I'll pay ordinary income taxes and a 10% penalty on earnings only. I shouldn't have to pay federal income taxes on the contributions or the principal portion of my investments when I take a distribution. However, if I received a state tax break when funding the 529 Plan account, I may owe state taxes on the principal portion of the distribution as well as earnings. I managed to spend all the college savings I had for my oldest son, who graduated from college recently. And I should be able to spend the money set aside for my youngest. But even if they had decided not to go to college right after high school, I wouldn't worry too much — especially when they are young. There are options to use this money. I'd consult with my tax accountant before making any moves. But I wouldn't regret saving for one of life's biggest expenses. Note: New Tax legislation now allows 529 plan money to be spent for a new category of educational expenses. According to the IRS, starting in 2018, qualified expenses include up to $10,000 in annual expenses for tuition at an elementary or secondary school. If you’re only using 529 money to pay for college, you’ll be missing out on education tax credits. According to the Internal Revenue Service, the American opportunity tax credit provides dollar-for-dollar tax credit, which covers up to 100 percent of the first $2,000 you spend on college each year and up to 25 percent of the next $2,000. Here’s more on the American Opportunity Tax Credit: https://www.irs.gov/uac/American-Opportunity-Tax-Credit. thanks for posting the IRS link, it was very helpful. My father has set up a 529 account for each of my grandchildren. My latest granddaughter was just born, and has been diagnosed with Downs Syndrome.. I am asking that he not set up that kind of account for her, but open up an alternative account that might be more appropriate. Would you agree? Congratulations on the birth of your granddaughter. I’m not qualified to give personalized advice, that should come from a professional who knows and understands all aspects of this situation. Children may or may not go to college; in some cases, planning for flexibility could be more useful than saving for a specific purpose like college. Just a note that Mitch Tuchman of Rebalance IRA (see sidebar) has personal experience in planning for a child with special needs. There is a new kind of account called an ABLE account. Specifically created for situations like yours. Funds can grow tax free and be used to care for your daughter into adulthood. Contact your financial advisor. I’ll be updating my article to reflect this information. What happens if your child joins the military instead or passes away unexpectedly? If your child goes into the military, the funds in the 529 plan could remain while he or she serves and then applied to educational expenses after the military service has ended or perhaps during service if he or she is able to attend school during this time. My understanding about the death of a child who has been designated as the beneficiary of a 529 plan is that the money can be withdrawn without incurring a penalty but taxes on earnings (not original contributions) will be owed on withdrawals.